Missionaries for The Church of Jesus Christ of Latter-day Saints began proselyting in the Maritime Provinces in 1833 when they arrived in Nova Scotia and New Brunswick. In 1843, missionaries were again sent to Nova Scotia by Joseph Smith, the first President of the Church. The Halifax Branch (a small congregation) was created 14 November 1843, and smaller branches began in Preston, Popes Harbour, and Onslow. Members of the Church in the Maritimes joined other Church members to migrate to the western United States during late 1840's to the mid 1850's. A group of 50 Church members (most of the Halifax Branch) traveled aboard the ship Barque Halifax, which departed 12 May 1855 and traveled around Cape Horn to San Francisco. This exodus ended organized branches of the Church in the Maritimes until proselyting was resumed by the Canadian Mission in 1920. Membership in the area was often depleted when converts moved to be closer to the established Church. As missionary work resumed in the Maritimes, missionaries presided over congregations in Halifax, Windsor, and New Glasgow. The Halifax Branch was again organized in 1947. Construction of a meetinghouse began was completed in 1959. In 1959, several converts were baptized in Bridgewater. A branch in Bridgewater was created in 1961 and grew to 135 members by 1967. A branch in Sydney was created in 1958. In 1974, membership in the Halifax and Dartmouth branches grew to about 750. Church membership in Nova Scotia grew dramatically during the later 1900's. The Dartmouth Nova Scotia Stake (similar to a diocese) was created in 1985. The Dartmouth/Halifax area in Nova Scotia continues to serve as the center of Church activity in the Maritimes. A temple was dedicated in Dartmouth in November 1999. Organization of The Church of Jesus Christ of Latter-day Saints occurred 6 April 1830, in Fayette, New York, with 50 people and six official members present. Ten years prior to the organization, the new Church President, Joseph Smith, received a vision and further instructions from God to restore God's Church on earth. In one year (1830-31) membership increased to more than 100. Kirtland, Ohio served as the organizational headquarters of the infant Church from 1831 until 1838. Membership grew from a handful of members to well over 2,000 before persecution and the financial upheaval of the times forced the Mormons to move on to western settlements in Missouri and Illinois. With the assassination of Joseph Smith in 1844 and increasing pressure on the Mormons to abandon Nauvoo, Illinois on the banks of the Mississippi, it became obvious to Church leaders that they would need to move. In 1846 the Saints established a refuge in what was called Winter Quarters, near present-day Omaha, Nebraska. In July of that year, the United States was involved in the Mexican-American War. While the pioneers were in Council Bluffs, Iowa, a request came from President James K. Polk for volunteers to march to Fort Leavenworth (present-day Kansas) and then to California on a one-year U.S. Army enlistment. About 500 men enlisted in the Mormon Battalion, and about 80 women and children traveled with them. They began their journey in the sweltering heat of Council Bluffs, Iowa, on 20 July 1846, leaving their loved ones behind. The battalion completed one of the longest infantry marches in American history — about 2,000 miles (3,220 km) through what are now seven states and into Mexico. The Mormon Battalion carved out a vital road for wagons through the American Southwest. In January 1847, Brigham Young received a revelation about “the Word and Will of the Lord concerning the Camp of Israel in their journeyings to the West” (now known as Doctrine and Covenants 136). When the first company of Latter-day Saint pioneers began to journey westward, they did not know their end destination. But on 24 July 1847, when the wagons rolled out of the canyon into the Salt Lake Valley, their destination became apparent. "It is enough," Church President Brigham Young said as he viewed the valley below. "This is the right place. Drive on." At least 236 pioneer companies of approximately 60,000 pioneers crossed the plains for Utah. With time, they transformed the desert valley into the bustling and prosperous Salt Lake City. Salt Lake City is home to the Church's worldwide headquarters. The Church has expanded throughout each of the United States. 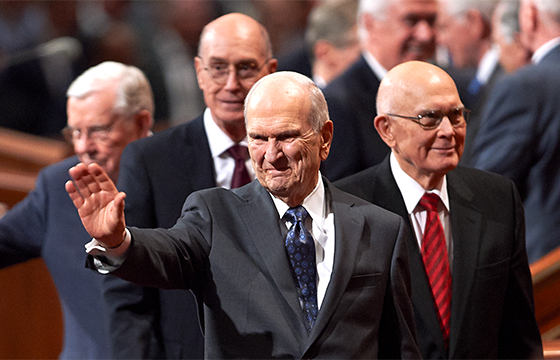 More than six million Latter-day Saints are spread throughout nearly 14,000 congregations.